This, my friends, is one of my favorite photos I have ever taken. 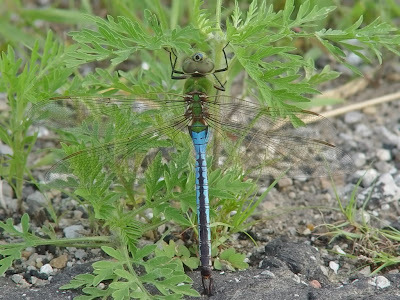 You see, last year, I continually saw these giant, gorgeous odonatas, whose technical name is "Common Green Darner" (Did I get that right, Bear?). However, I was always frustrated because I could never get a photo of one of these beauties, because they would just fly around like bright-blue mini-helicopters, and it seemed they would never sit still long enough for me to capture them in a photo. So, when I got this shot, I was practically skipping and doing cartwheels down the road on my return home (OK, maybe I was skipping, but there's not witnesses to testify to that). Anyway, this may just be a photo of a "yucky bug" to many of you. But, every time I look at it, I'm full of pride. That's why I love it here. I love the very rural surroundings and the nature around me. It makes me happy to no end to know that I could just go outside with my camera and sit on my patio furniture and lose myself watching the birds, the insects, and the critters. Now, if only the weather would cooperate! We have flood warnings/watches all over. I don't think we have had a full 48-hours without rain for over a month! In fact, today is supposed to be a very nice day. However, guess what is supposed to happen tomorrow... Yup, thunderstorms. UGH! I don't think I have every seen one close up! They are fast little buggers! wow, that's one crazy photo!!! amazing! One of a kind awesome photo. It was so nice of him to don that smile and pose standing still for you! Yep, you have every right to be darn right proud of that! That' awesome. Clicking on that photo brought in all the details of that little guy! Splendid, my friend, and I would say that's definitely in the top choices of the best photos of insects I have seen all month and my goodness I have seen lots!! SUPER nice!! If you have a moment please do stop by. Have a great weekend! That is so cool girl! Wow, what a fantastic photo! I love the blue on it's tail. Misty: Nicely done, flying bugs are hard to capture. Yours is really nice. I'd be doing cartwheels too, Mist. Great shot. That's an incredible shot! It's so hard to catch them like that, they move so fast! My week to be sick (and the last week of school and trips and inservices — it's a wonder it hasn't killed me) . . . and you should be proud! I haven't seen any outside yet (but haven't been out much yet), and it is one of my dream shots, too. Good for you!!! I have never ever been able to cartwheel, but I would if I took this shot. That is simply AWESOME!!! Even the teenager said "Wow!" when I showed him.It is absolutely brilliant. Well done. At first I thought it was a dragonfly of some sort but after I read the rest of the post, I guess not! Great job capturing that shot, you had every reason to skip and turn cartwheels and even whistle if you'd wanted! Looks like a beautiful, bug ballerina to me. Spectacular capture, Misty Dawn! Very pretty! If only there was a good way to make them sit still for their close-ups. I love his "pose"!! Great shot, Misty! I was going to post a dragonfly for last week but when I came to look at the pic, it wasn't as good as I thought. Your darter is a good 'un. Very good shot, I always find they move too fast to get a photograph. Helloooooo, Im late Im late, Mines up now,..
Misty! That is a wonderful shot. Wish I could get one myself! WOW that's a great shot - I didn't think it was real at first! Yes, a yucky Darning Needle (as we called them) but a magnificent photo by you, Misty! My CC is up! so excellent- I want to hear that you got a nature magazine job- you and my girlfriend Ruth have the gift!!!! Excellent capture. I have never been able to get a photo of a dragonfly. Tons of blurry photos, but never a good clear shot. I hear you on the weather. Storm after storm after storm rolling through here. Just had a whopper pass through this morning. It's a great capture, Mist!!!! Ahhhh...Grasshopper...you have snatched the stone! Well done. I’ve shared at Small Reflections. Happy Blogoversary my BBFF! I LOVE YA! Great caption on that photo, it suits it! That's beautiful I love dragon flies. Wow, that's an awesome shot of a dragonfly. Wishing you better weather ahead. I can see why your proud..that's a great shot! That's a truly awesome macro. Great work! That's an incredible photo. The wings look so delicate and the colors are beautiful. Great job Misty! I would have been doing cartwheels too, that is if I could manage! what an awesome capture. Thanks for offering CC to us.